If you have done any reading on Australian Ciders you’ve probably come across an article written by James Adams. Adams has been writing about ciders for a few years now as well as judging the odd cider competition. Now he has turned his palate and cider knowledge to making his cider: Adams Orchard Apple Cider. If you read any of Adams work you’ll know he is a big supporter of real cider made from real apples. So when it came time for him to branch out and make his own cider he practiced what he preached and made a real cider. 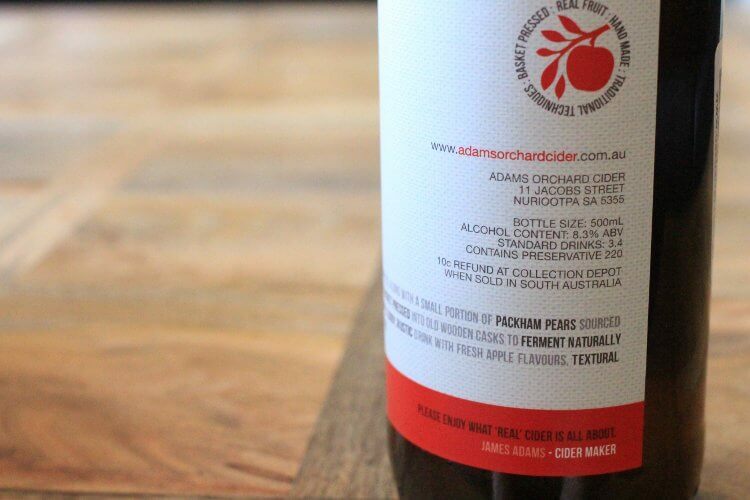 Adams Orchard Apple Cider uses apples from the Adelaide Hills and the Barossa Valley. Namely Pink Ladies, Fujis and the odd Packham pear for good measure. Hand milled and hand pressed, these traditional techniques help add an air of authenticity to Adams Orchard Cider. The final step in the process is 6 months on lees inside of French oak barrels. The lees help thicken the flavour while the oak barrels are for rounding out the favours. I don’t think I’ve ever smelt anything like this. It’s very hard to describe. The closest I can compare it to is a bottle of dark rum from Belize sitting on my top shelf. But some how this seems brighter. I was really surprised by the taste, unlike any other cider I can remember. The taste is where the French oak shines through. Upfront that oak taste has been sanded smooth as an antique tabletop. I can’t believe how much this tastes like that rum, unsurprising though as they are both aged in oak all be it Adams Orchard is French oak and my rum was American oak. The finish becomes little tarter thanks to some of the Fuji apples. The sweetness doesn’t really factor into the equation but a cameo by some Packham Pears adds just enough to balance it all out, saying that its dry cider. The mouth feel is thick and full and acts as a vessel to carry that long, tart and tannic finish in this cloudy cider. I keep coming back to heavily wooded rums, this cider is a rum lovers dream. Saying that, it’s not to be thought of as the type of drink that should be added to a cocktail with a paper parasol. Think of it more as a sailor’s rum, dark and stormy to comfort you on a dark and stormy night.